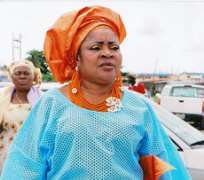 After 23years of living separately from the father of three of her children, Queen Salawa Abeni has said, God should be the judge of whatever bad Kollington Ayinla has done to her. She made the statement recently at the Annual London African Music Festival. She is gradually bouncing back to the music industry after years of taking a break due to a throat ailment. She also said she is thankful to God because she did not believe she could get a cleaning job, not to talk of becoming a celebrity due to her poor educational background.